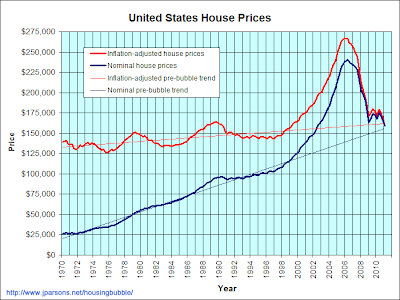 When I updated my inflation-adjusted real estate charts early this morning I was shocked at what I saw. The U.S. national housing bubble is finally gone. That said, there are still many local bubbles, especially in the Northeast (D.C. and up) and the West Coast. In contrast, other regional markets such as many of those in the Rust Belt and the Sun Belt are now either fairly valued or undervalued. I have argued in the past that real estate prices don't overshoot to the downside. The next few quarters will reveal whether I was right or wrong about that. According to the S&P/Case Shiller 20-city index, prices rose 0.7% compared with March, although they fell 0.1% when adjusted for the strong spring selling season. Prices were down 4% year-over-year. "In a welcome shift from recent months, this month is better than last — April's numbers beat March," said David Blitzer, S&P's spokesman, in a statement. "However, the seasonally adjusted numbers show that much of the improvement reflects the beginning of the spring-summer home buying season." These Case-Shiller numbers really represent March more than April. The S&P/Case-Shiller indices are trailing 3-month indices. The "April" numbers really represent the combined average of February, March, and April. I think you guys all know I much prefer year-over-year numbers to month-over-month numbers. The longer time span makes them far less volatile, plus they are automatically seasonally adjusted. That said, the non-seasonally-adjusted uptick suggests that spring home sales picked up like clockwork. It also suggests that the whole stock market freakout about a possibly weakening U.S. economy over the past two months may be a bit misplaced. I expect to see the month-to-month non-seasonally-adjusted housing numbers to continue rising over the next 5 months or so. The new S&P/Case-Shiller numbers come out later this morning. In the meantime, I thought I'd show you guys this little graph from CNBC. It shows that since the peak, the lowest tier of homes have fallen the most. But, the reason they have fallen the most is because they rose the most during the bubble. I was able to check the last time the real, per capita value of US housing equity was at its current level. Even after looking at all of these graphs, the answer astonished me: 1978. Nineteen seventy-freaking-eight. While the rise and fall is obvious from these two graphs, the thing I notice is that they were both basically flat prior to 1998. 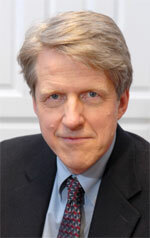 In fact, that's what Robert Shiller's research says: Inflation-adjusted housing values tend to be flat over time. The only way per capita real housing assets should rise is if people build larger houses. Ben Bernanke and the rest of the Federal Reserve have grown more pessimistic about the state of the U.S. economy. At the conclusion of a two-day policy meeting, the central bank said that while the recovery is continuing at a moderate pace, growth is somewhat slower than expected. It also said the jobs market is "weaker than anticipated." It also issued new economic projections that call for slower economic growth, higher unemployment and higher inflation in 2011 and 2012 than in its previous forecast. At a press conference Wednesday afternoon, Fed chairman Bernanke referred to the new forecast as a significant revision. The Fed said in its statement that it believed some of the headwinds would be short-lived, including supply disruptions from the Japanese earthquake, and the "effect of higher food and energy prices on consumer purchasing power." But Bernanke said he and other Fed policymakers aren't certain how much of the weakness is due to those temporary factors and how much is due to longer-lasting problems. He said continued problems in the housing market, excess private sector debt and weakness in the financial sector might be more serious than previously thought. And he suggested the labor market is a long way from being healed. Whoa. Sales of previously occupied homes in the U.S. fell in May to the lowest level in six months, the National Association of Realtors reports. That’s not good news, given we’re all waiting for the long-awaited recovery to finally arrive. Sales of existing homes fell 3.8% from a month earlier to a seasonally adjusted annual rate of 4.81 million. As we report, it was the weakest showing since November. To be sure, unusually weak weather hurt sales. But housing’s pain will persist until the employment market and housing prices stabilize. For now, prices continue falling: The median sales price was $166,500, down 4.6% from $174,600 a year earlier. The inventory of homes listed for sale, meanwhile, slipped slightly at the end of May to 3.72 million, representing a 9.3-month supply. A healthy market has a roughly six-month supply. Sorry about the lack of blogging over the past week. I've been busy building a new feature for my website. I expect it will be ready to go live by July 1st and I will announce it here on Bubble Meter. Apparently, the housing bubble was a one-way bet for some home buyers. 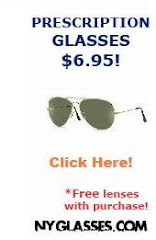 If prices went up forever, they got rich. If prices fell, they got to live rent-free for 18 months. Even the National Association of Home Builders’ top economist is sounding a bit gloomy these days. In an interview, Mr. Crowe said the start of the year was “much worse than I expected,” noting that overall economic growth was weak, the labor market grew less than forecast and consumer confidence hasn’t picked up. High gasoline prices, he said, are “just a joy-killer” that makes consumers less interested in purchasing a new home. In an off-hand remark before cameras and microphones, economist and housing market guru Robert Shiller opined earlier this year that he would not be shocked if there was another 10% to 25% in the nation's home price plunge — and he's not backing down from that statement. 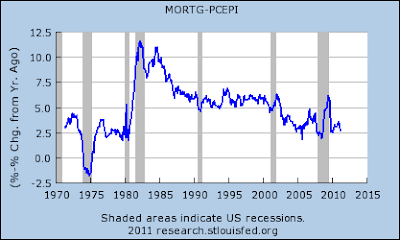 The above graph shows the real (inflation-adjusted) 30-year conventional mortgage interest rate since 1971. Home prices won't rebound until jobs come back. But jobs won't come back until the housing mess gets fixed. That's a problem because both the housing market and the broader economy are having trouble getting back in gear. Hiring is losing steam, and after home values hit a post-boom low, many are projecting further price declines. Doug Duncan, chief economist of mortgage finance giant Fannie Mae, is focused on the impact of jobs on housing — and vice versa. On Wednesday, payroll processor ADP reported that hiring by businesses ground to a halt in May, raising concerns about the recovery in employment. "The ADP Employment report coughed up a hairball in May," Robert Dye, senior economist with the PNC Financial Services Group, said in a research note, referring to a report by payroll processing company ADP released Wednesday. That report showed private sector employers added only 38,000 workers in May, far lower than the revised 177,000 jobs added in April and much weaker than economists had expected. The ADP report followed on the heels of an already disappointing jobs number released by outplacement consulting firm Challenger, Gray & Christmas on Wednesday morning. According to that report, the pace of planned job cuts edged higher in May, as 37,135 jobs went on the chopping block — a 1.8% increase from April's planned job cuts. But government sector layoff announcements dominating those numbers.